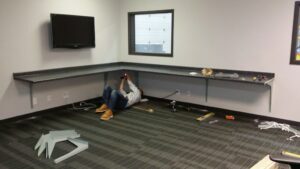 Titus Contracting was contacted by Dish Network, located in Brooklyn Center MN, to help with a commercial remodeling project when they moved to a temporary facility. 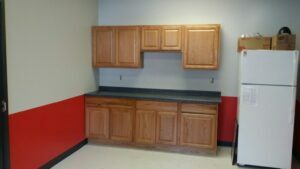 They wanted to expand their space into their warehouse area and create additional access to their commercial space. We remodeled their current commercial office space to better suit their wants and needs, as well as updating the space to look more modern. Their new commercial space also needed to be made ADA compliant for visitors with disabilities. So why did they choose Titus Contracting? Our bid was competitive, and they found our proposal to be incredibly thorough. We allowed them to work with their own architect, and they loved our willingness to work within their schedule and time frame. This project had a couple of major elements to it. One of the first things we did was install a flammable waste tank. 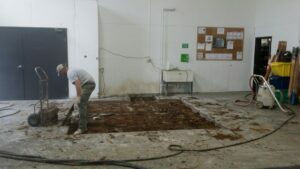 This required us to first dig a large hole in the ground of their warehouse space in order to install it. We also needed to cut open the wall of their warehouse and build in a 12 x 14 garage door for their work vehicles. 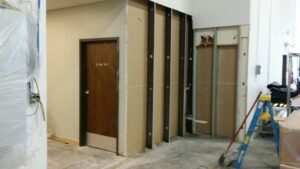 In the office area, we built walls and added long countertops for workstations. 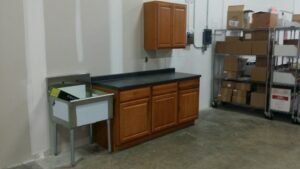 We also installed new cabinets in their break room, and added cabinets and a sink to the warehouse area for a coffee bar/water station. We began work on this project last November and finished at the end of December. We are very pleased to be contracted by such a reputable national company, and we are happy with the end results of this commercial remodeling project. Are you interested in learning more about this commercial remodeling project, or are you interested in learning more about how to hire us for a commercial remodeling project of your own? Call Titus Contracting at 952-746-7817 or you can contact us to get a Free Estimate.